Well, what can I say? If I am a man, I think I will want to find a wife like me. Because I can cook such awesome dinner for the kids at a fraction of the price I have to pay at ‘chuchar’ stall. 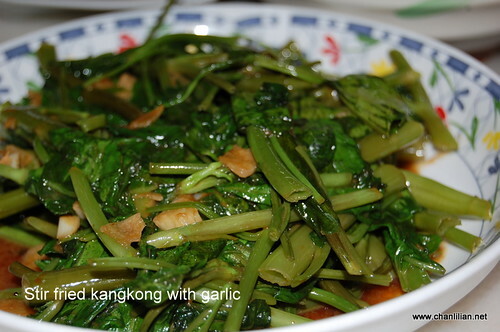 For RM1, my wife will be able to cook a big plate of kangkong with garlic, enough fibres to give me a huge pangsai, no need to suffer from constipation every morning. 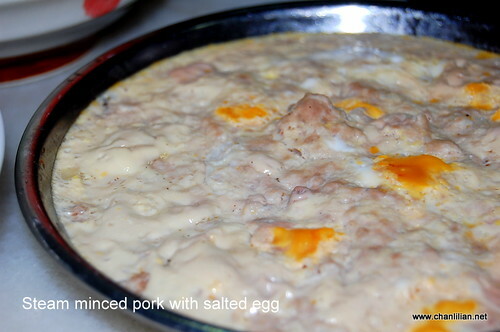 My considerate wife also cooks another dish to suit the younger kids like this steamed pork with salted egg. And with the bones of the chicken she removed to make the gungpo chicken, she used it to boil soup with ‘tua thau chye’ or ‘big head, pickled lettuce’. The price of the lettuce costs only 50 sen and the chicken bones are free. With the amount of money the wife saved, she can use it to buy another gadget really soon. Let’s see…in the last two months, she had bought an Acer laptop, a Canon video camera and now, she is cracking her head what else to buy. Psst…people, for the next two days, you have to come to the SECOND post to read new post. It is part of the ‘arrangement’. Boleh faham? I love ‘Steamed pork with Ham tan’! CK recently tried dishing out his first Gungpo-Kai with the help of live cooking instructions from his aunt in KL thru’ his mobile phone! 9pek9bo – LOL, the cost of the phone must be more expensive than eating at restaurant. 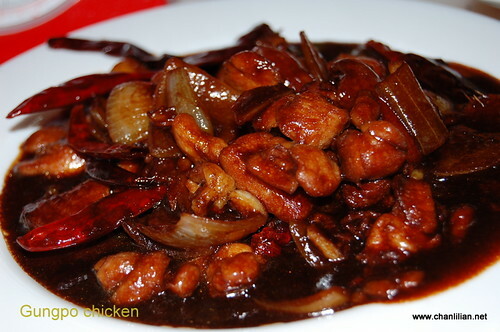 Wahlau… all sedap-sedap. I like all the dishes. Slurp. 🙁 my mum cook all the chicken dishes with bones 1.. that’s why i don’t like eating home that much. suzette – Eheh, nay, the 48 hrs ruling? If you tak paham, means I am very terror in crapping lor. Nice dishes. 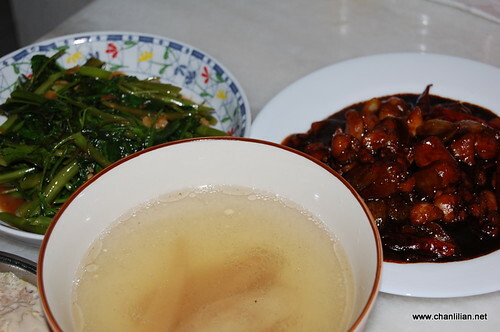 My mum make the minced pork with salted eggs also sometimes. Love it. Hahaha.. 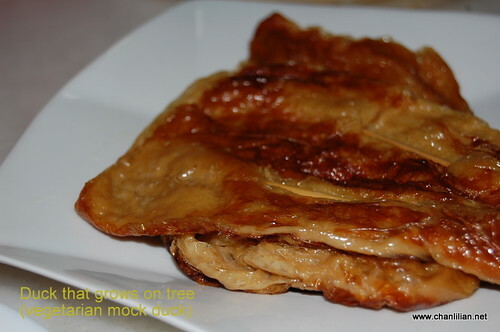 I like the “duck which grows on trees” too. Your dishes are scrumptious! Thanks. I think I know it now, but still dunno about the 48hrs ruling. Is this new? My God! I have been so behind in all updates!! … But still can’t deny u r very terror, so natural. Honestly, though I suspected but still couldn’t resist to click the ‘continue’ thingy. LOL! Nadlique´s last blog post..Discussing about Amanah Saham Bumiputera’s (ASB) Maximum Amount Above RM200,000. Whether you can withdraw your money and deposit back or not.